In less than 20 hours I will start my swim. Dawn brought sun and less wind today. The forecast for tomorrow says it will be a good day. We’ll see. Yesterday we had our last training session; we spent an hour in the water park, had a conversation with the captain of our boat and went shopping for the trip. With everything that happened in the morning we weren’t able to go shopping early, so we had to leave it for the end of the day. That does not mean that we bought less stuff, however; the team provisions itself as if it’s going to be shipwrecked on an island. Everyone stocks up on all the goodies he or she can find. The least inhibited was Pablo, who grabbed milk, chocolate, Oreos, chips, etc. Loading the bags into the car, Nora could not restrain herself and said it was clear that we were never going to be making it to the supermarket. The meeting with the captain took place after lunch. His house is just meters from the hotel, literally facing the sea. We noticed the judge for Rohan’s swim was in the lobby and asked him to take us there. Captain Mizushima is about 50 years old, with a face and hands that reflect tmany days on the sea. Although we have read about the challenges of Tsugaru, we wanted to hear from him what each section of the swim was likely to be like. The first 8 kilometers are simple—the peninsula protects us as we’re leaving the shore of Tappi. During the next 12k we are between the two islands and the currents are strong; probably we will be swimming at a 30 or 40-degree angle to the coast to offset those currents. The following 6k have less complexity, but the last 5, with strong currents that make it difficult to reach our arrival point, are a nightmare. On average swimmers spend from 3-4 hours in this area. From the stress the captain placed on this, it seems that the last few kilometers are going to be the real challenge of the swim. His recommendation was to conserve energy for the final stretch. 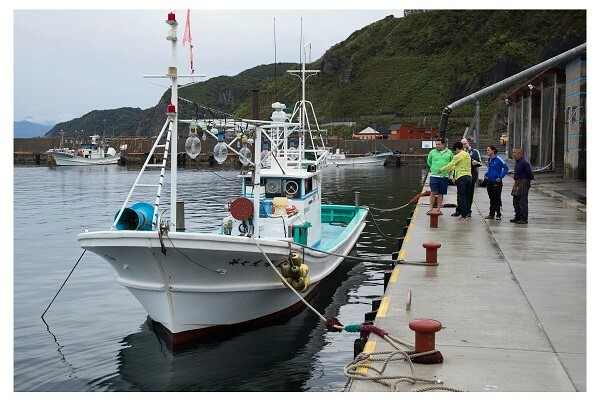 The boat is a typical fishing boat; there’s no cabin for passengers, nor space to sit. Fortunately, Daniel warned us and we’ve brought along our own seats, along with a good supply of food. I just hope that Pablo and Guillermo don’t become seasick and can enjoy all the snacks they got. We arrived at the water park at 11:30 a.m, with Rohan planning to swim 30 minutes and us one hour. During the swim, Nora became worried that a boat, almost a kilometer away, was going to run us over. I tried to calm her down, but she recommended a quick swim and to get back to the protected area. With the exception of Nora’s concern, the swim was quiet. However, marking the day was an unexpected event after swimming. When we came out of the water, Guillermo gave us the news that Mrs. Saiko was awaiting us in her house for tea. “Everyone?” I asked. “Yes, everyone—including the three Indians.” As we arrived, I worried about all seven of us trooping inside. The image that I have of Japanese houses is that they are very small. After we knocked on the door she opened it and asked us to take off our shoes and move to a place that looked like a small vestibule. There was an altar, photographs and a Korean eagle. Pablo barely fit inside. Several times he was about to bump his head and struggled to find a space where he felt comfortable. Saiko introduced her brother and began to make tea, but not before giving us Japanese sweets to eat. I imagine it is to balance the remarkably bitter taste of the tea. William told me that we were witnessing the Japanese tea ceremony, a ritual preparation of green tea or matcha, influenced by Zen Buddhism, in which the drink is served to a small group of guests in a tranquil setting. For some guests the taste of tea was so strong they preferred to take it in one gulp. I enjoyed it, however, and took the opportunity to eat another sweet. We learned that the brother is a retired jeweler. He told us about his crafts and that their mother turned 100 last year. They were happy because soon she will celebrate her 101stbirthday. Then Mrs. Saiko flattered us by presenting Nora with a Japanese fan and offering me some photographs. Fortunately, Nora brought some little ceramic boxes with her, so we were able to return the gesture. When it seemed to us that it was time to conclude our visit, we offered our appreciation for their kind attention and prepared to leave after taking pictures with our hosts. We realized we had to change our plans. There was not enough time to go shopping and return to the hotel to eat. We decided to leave shopping for the afternoon—nobody complained. Today we had an incredible experience. For us and for team Rohan, this was an opportunity to interact closely with a Japanese family; for them, our visit was important because in all likelihood it broke their routine, and now they can say that they once had a group of Mexicans and Indians at their home. I shouldn’t think that happens too often in these latitudes. Overall, it was yet one more day in which we found that connecting our spirit with the life of these people has borne fruit. We will carry with us the hospitality and friendship of these two human beings.